For most Americans, the word “duck” conjures up the image of the quintessential mallard drake, with his green head, yellow beak and classic “quack!” Some Marylanders, however, are much more attached to another bird: the wood duck, or Aix sponsa. The male’s iridescent green crest, scarlet eyes and beak, and speckled chestnut breast make him unmistakable. So beautiful is the wood duck’s plumage that the Latin name sponsa means “betrothed,” as though he is dressed in his finest clothes for a wedding. Wood ducks are one of many duck species that thrive in Maryland’s fields, forests, skies and waters. 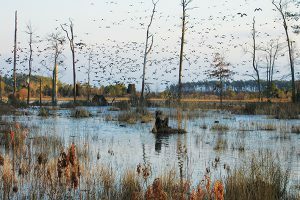 According to Josh Homyack, a waterfowl project manager with the department’s Wildlife and Heritage Service, the variety of habitats in the Chesapeake Bay watershed allows it to support a remarkable diversity of waterfowl. The bay’s large expanses of shallow water teem with submerged aquatic vegetation and invertebrates that ducks love to eat. Wood ducks nest in tree cavities in close proximity to water. They can be spotted in wetlands and tidal marshes, but are often found further inland near freshwater ponds in the woods. Unlike the many migratory waterfowl species that briefly visit our state, a significant population of wood ducks use Maryland habitats for nesting, brood rearing and pre-migration foraging before heading south each fall, says Homyack. Sadly, our watershed hasn’t always been a haven for waterfowl. 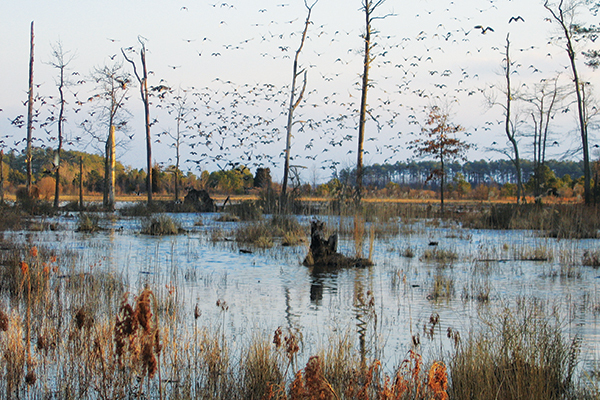 Early American settlers, eager to develop the frontier, cleared timber and drained the wetlands that these birds call home. They found wood ducks particularly tasty and later began to decorate ladies’ hats with their plumage. Unregulated market hunting, often with the use of massive punt guns, accelerated the population decline of wood ducks and other waterfowl species. By the early 20th century, wood ducks faced the brink of extinction. Fortunately, wood ducks became one of the first beneficiaries of modern conservation efforts, including the Migratory Bird Treaty Act of 1918, the centennial of which we celebrate in 2018 during the “Year of the Bird.” Through careful management and the coordination of conservation strategies, wood ducks have made a marvelous comeback in both Maryland and the nation. The department plays a key role in monitoring and supporting wood duck populations. We cooperate with other states in the Atlantic Flyway (the migration route spanning from eastern Canada to Florida) along with the U.S. Fish and Wildlife Service to assess habitats and populations. The migratory nature of waterfowl necessitates regional, national and international cooperation to ensure robust populations exist for future generations to enjoy. “Maryland is just a portion of the whole picture,” says Homyack. One key tool for population monitoring is banding. During this process, biologists carefully capture live ducks with nets or traps. They record data about each bird, place a numbered metal band onto its leg and release it back into the wild. Banding takes place across the continent in periodic intervals throughout the year, most importantly before each hunting season. 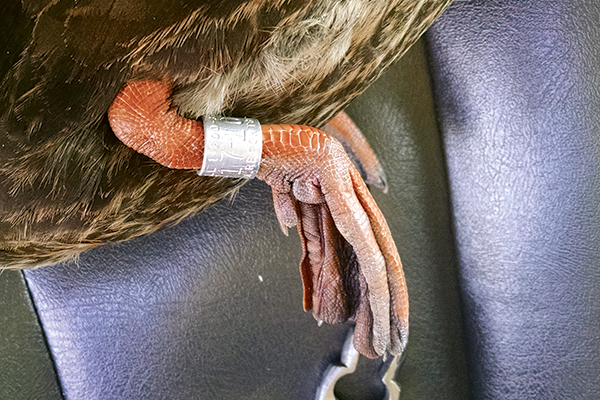 Most of the data from these bands is gathered when hunters harvest a banded bird and report their finding online. This information is used to determine future regulations, particularly hunting season length and bag limits. Data gathered from Maryland is analyzed by the U.S. Fish and Wildlife Service and helps inform conservation efforts of Ducks Unlimited, Delta Waterfowl and other state wildlife agencies. The department also plays a key role in supporting the efforts of volunteer organizations like the Maryland Wood Duck Initiative. Launched in 2004 by Cliff Brown, this all-volunteer network partners with more than a hundred organizations to construct, deploy and monitor approximately 1,800 nesting boxes statewide. 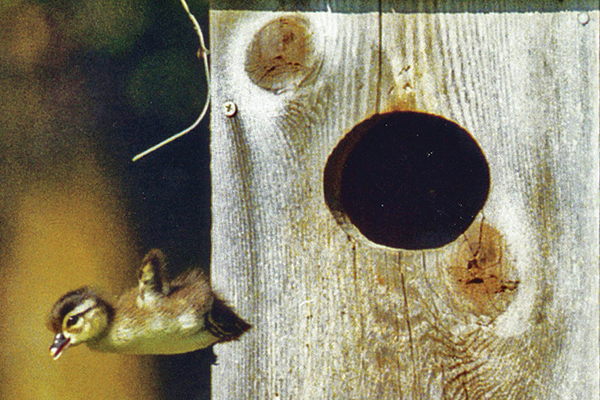 Since the program’s inception, its nesting boxes have been responsible for bringing 70,000 ducklings into the world. Through this program, volunteers across Maryland like Jadyn Hickman (see below) have the opportunity to enjoy what Brown calls the total wetland experience. “People want to do more than just donate—they want to go out and make a difference,” he says. 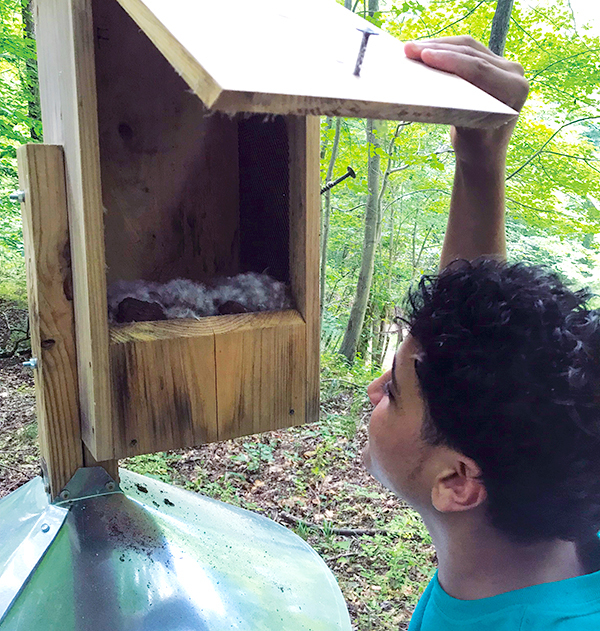 Department staff are instrumental in this effort by supplementing funding, assisting volunteers, providing access to different habitats and keeping an eye on nesting boxes. “The cooperation has been incredible,” says Brown. 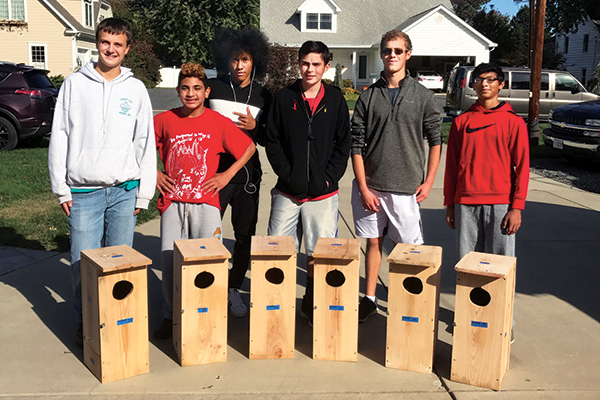 Jadyn Hickman, a Life Scout belonging to Boy Scout Troop 238, completed his Eagle Scout Service Project by building and installing six wood duck nesting boxes. This project was aided by staff from the Maryland Department of Natural Resources, Maryland Wood Duck Initiative and Delta Waterfowl. Jadyn and his team deployed his boxes along a creek in Havre de Grace in November 2017. 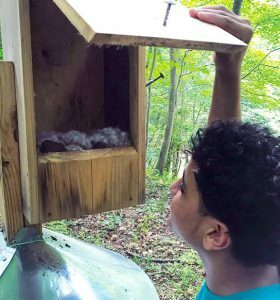 “The installation of the nesting boxes was my favorite part,” says Jadyn. This spring, he found that two of his boxes were used by wood ducks, and observed evidence of six successful duckling hatches! Jadyn plans to keep an eye on the boxes in the future, and hopes that one day all of the boxes will be occupied by wood ducks. He advises others who may want to undertake such a project that it requires hard work, lots of learning and, most importantly, teamwork. Photos by Michael Tarquini: Jadyn inspects box; Jadyn and his team proudly display their boxes. The results of all of these endeavors speak for themselves. 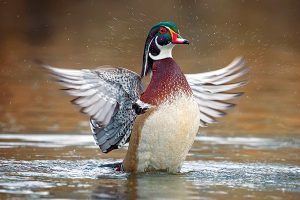 According to Homyack, wood duck populations in the Atlantic Flyway have been flourishing over the past 70 years and holding steady over the past 15 years. Population figures are greatly influenced by variations in weather from year to year, but the overall outlook is promising. Thanks to the amount of rainfall this year, “it looks like it’s going to be a great year to hunt wood ducks,” says Homyack. This year, the daily bag limit for wood ducks is three. Duck hunters must possess a Maryland hunting license in addition to a Federal Duck Stamp and a Maryland Migratory Game Bird Stamp. The purchase of licenses and stamps is an integral piece of conservation management. Their sale is essential for funding efforts to protect wildlife like wood ducks. For example, funds from the Maryland Migratory Game Bird Stamp help pay for building materials for Brown and his volunteers, seeds and wells for Webster’s waterfowl habitats, and the nets and traps Homyack needs for banding. As of July 2018, over 50,000 Maryland Migratory Game Bird Stamps have been sold. Hunters and non-hunters alike can purchase these beautiful stamps to support waterfowl conservation in the state. No matter the scale of their project—be it the excavation of a wetland, the construction of a nesting box, or the purchase of a stamp—passionate Marylanders continue to make a huge impact on wood ducks’ rebound and success. Their incredible conservation story over the past century perfectly illustrates how biologists, lawmakers and volunteers can come together. Thanks to these efforts, Maryland’s sky can be painted with the brilliant colors of wood ducks for many years to come. Article by Emily Durell—Office of Communications intern. Appears in Vol. 21, No. 4 of the Maryland Natural Resource magazine, fall 2018.